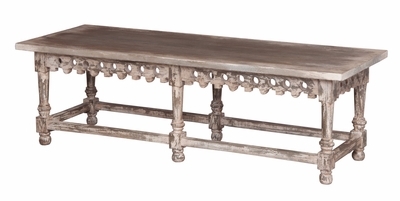 COFFEE TABLE-BENCH WITH ORNAMENTAL APRON - Truly versatile, this piece serves as both a coffee table and a bench. The ornamental apron and finish in Potting Shed with white hang-up distressing adds just enough detail to make it a worthy focal piece. H 16" x W 52" x Depth 20"